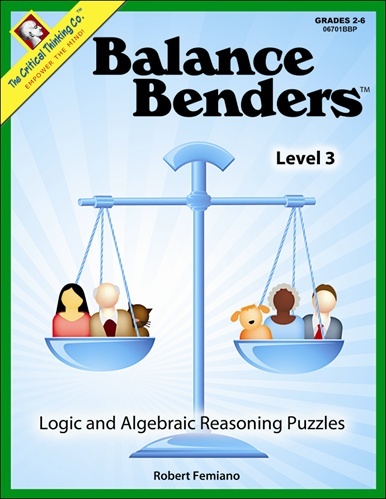 Children develop deductive thinking and pre-algebra skills as they solve balance puzzles. 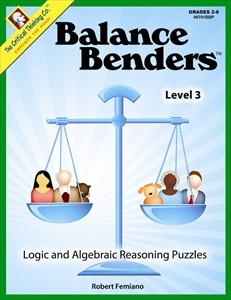 Children must analyze each balance to identify the clues, and then synthesize the information to solve the puzzle. Book includes teaching suggestions and formal presentation of the relevant algebraic concepts. The more complex puzzles at the end of the book have hints (upside down at the bottom of each page). The solutions include discussion of the algebraic concept used in solving each problem. Educational for children and great fun for parents too.